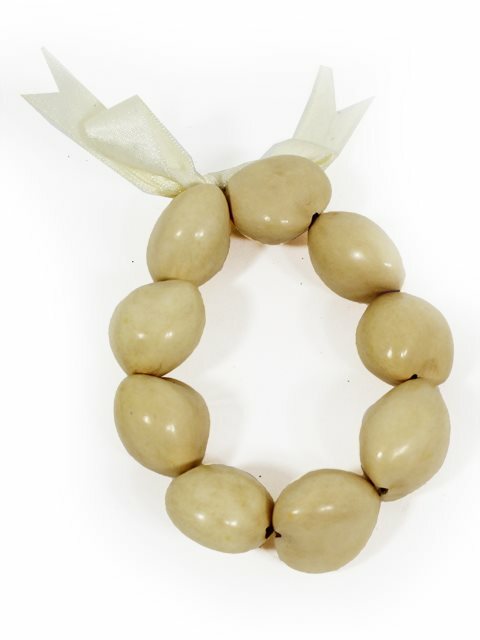 This kukui nut bracelet is made of glossy-natural kukui nuts. The string holding it together is elastic, which makes it very easy to put on and remove. Historically, kukui nut bracelets were only worn by royalty; usually by the ali'i (reigning chiefs of an entire island). Today, the kukui nut bracelets are worn in hula performance, usually in the kahiko. These go very well with our kukui nut leis. * Trivia: The kukui nut tree is Hawaii's state tree. A classic! Light and very comfortable to wear. This Bracelet Is Beautiful And Affordable... I'm So Glad To Have Made This Purchase!! I love this wooden brown bracelet and its matching necklace. However, I had the hardest time finding earrings to match, trying two different pairs online. Could you please offer matching earrings for this set?? A simple pair of matching wooden brown balls -- in posts (studs) -- would be perfect. Beautiful boho bracelet. On trend now with shell jewelry for sale at high end brands like ETRO! Purchased one a year ago, decided wanted to use as an ankle bracelet,,,,,perfect!